That is the game I got, yes : p And yeag, Lymle hates Faize. Am sure that at some point theyll become friends, though. Recently I got Mario Kart Wii, essentially completing the entire Mario Kart series (I now have all 8 Mario Kart games), The Legend of Zelda: Skyward Sword, and best of all: A Japanese copy of Pokémon Platinum, with a near perfect Pokédex with all 493 Pokémon seen, and approx. 416 owned! Unfortunately, it doesn't seem legit, as clearly there was some heavy action replay usage as I have 999 of almost every item... Oh well! I like to cheat too, and I finally got a Japanese Pokémon game! I found infinite undiscovery for cheap! Im super excited to try it eventually (am still playing star ocean) the game looks amazing. Is by the same team who created star ocean and tales of, so it has that fast paced real time battle system. Am pumped. I doubt that it will be as great as ttyd, but I imagine it will be the next best thing, and that Ill like it alot : p Am excited to play it. I spent hours on the original Paper Mario alongside Kirby 64 and Banjo-Tooie! You'll definitely enjoy it, it's what started off the paper mario series although it does have a lot less to offer than TTYD it's still rather enjoyable to this day. 4th chapter in it is probably my fav it's got the best music, also as far as cartridge rattling goes it might be nothing some carts I found in like thrift stores rattle it's probably due to age but in any case enjoy! I definitely dont expect it to be ttyd : p But that doesnt mean I cant enjoy it. Am also happy to have the two real rpg paper mario games, haha. Ye Paper Mario kind of dies off after super paper mario and even than this game isn't much like the first two. I looked up a video on how to tell if a n64 cart is a reproduction or not, and my paper mario is DEFINITELY a reproduction : p The label is all glossy, the back label is a different color than the ones on my other n64 carts, and the little nintendo label indentation on the top of the back of the cart looks sloppy compared to the others. I sent this to various friends, but I had forgot to post it here! 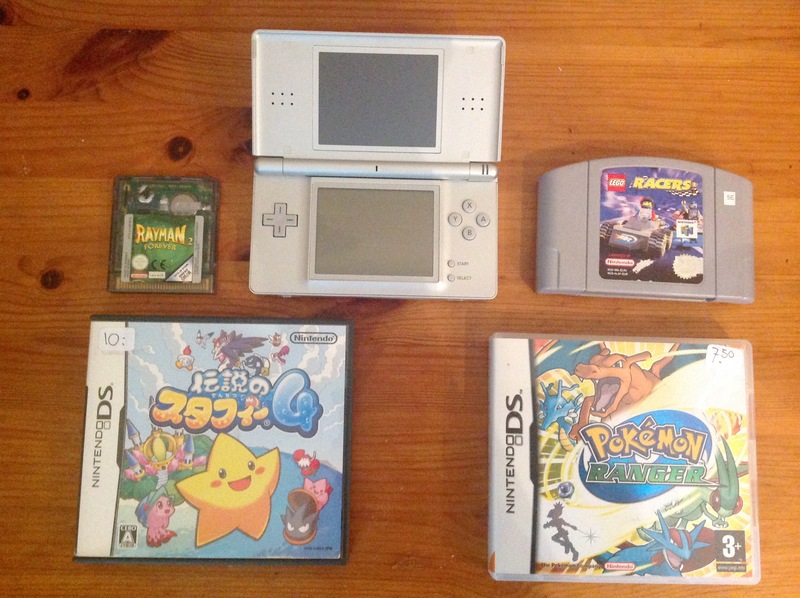 I went to a video game con/fair last Sunday, and finally got a Nintendo DS! Then I needed some games to play on it, so I started going through everything again, but now at a leisurely pace. I wouldn't have minded games without the box, as I've only got a single Game Boy game complete, in total. But almost all DS games were in the box. I looked at some games for other systems too, and even though I was planning to not buy any Game Boy games, when I saw "Rayman 2 Forever" for only €2,50 I had to buy it. Rayman 2 is a 3D game, of course, and this game seems to be using assets of the original Rayman, but featuring new level design. It's zoomed out a lot, which makes Rayman appear really small, but it does also make it a lot easier to see where you should be going, which is nice. I haven't played it a lot yet. I thought I might come back and buy New Super Mario Bros. anyway, but then I found a table with two cheap games I knew I'd like: Pokémon Ranger and 伝説のスタフィー4 (The Legend of Starfy 4). I've seen PkGam's 100% walkthrough of Pokémon Ranger, and it seemed like a really good game. I've also seen PkGam's walkthrough of The Legendary Starfy, which is an English translation of Starfy 5 (I thought Starfy 3, but I was wrong). Starfy 1-4 weren't translated to English. The Legendary Starfy seemed like a really fun game, so I thought I'd enjoy this one as well! Then lastly I saw Lego Racers for €5. The sticker is damaged, but I don't care. It's Lego Racers, I buy it because it's fun to play, not for collector's value. I played Lego Racers on a friend's pc as a kid (or maybe just watched him play it, I don't recall :P), and I've always heard it mentioned as a fun game! I got Hollow Knight recently and holy crap is it excellent. It's a Metroid-style game, but imo it's way more interesting than Metroid. The setting is completely unique and never once has anything felt cliche or repetitive, despite the backtracking inherent in these kind of games. I'm already like 40 hours in and I'm baffled how a 2D sidescroller has managed to effortlessly keep me hooked this whole time. It constantly throws new things at you that are completely unexpected. Definitely one of my favorite exploration-based games of all time. Oh, and it's only 15$ bucks, but has as much content as a triple-A game imo. Almost half? I don't think I've ever seen it for less than €100. :P Although I just checked, and found out that the American version does indeed sell for cheaper. I'd probably get it if it was only $50! To be frank, though: a bootleg's a bootleg, to me it doesn't matter whether there's a working save battery. Although I can imagine it feeling better to play a bootleg on an actual console than playing a downloaded ROM. 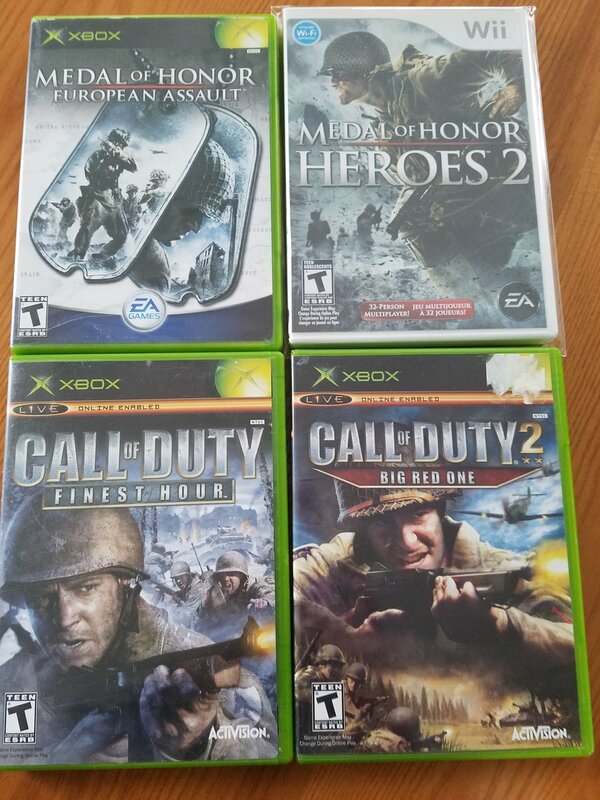 I played finest hour on gamecube back like ten years ago. I always wanted to try big red one but never had the chance. I just learned about european assault like two days ago though, would like to try it. I'll have to wait a bit to paly it since I still need to wait for my x360 hard drive transfer cable in order to be able to reinsert the BC partition in my xbox 360. I do like some fps games on occasion though, I like to be diverse with junk, including games. Can have more fun if you let yourself enjoy more things. I found Blue Dragon for 360 for pretty cheap. Im usually not super excited for square enix games cuz I usually dont enjoy their games as much, and I know bd has alot of FF influences in it. But I also am looking forward to a more classic jrpg experience on the 360, so hopefully Ill like it.